Following on from Rose, which was set in modern day, The End of the World proves that this is a time travel show by taking us billions of years into the future. 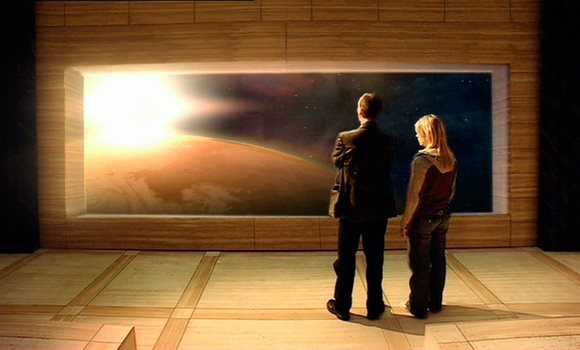 The Doctor takes Rose five billion years into the future and they join a exclusive, VIP, party on board Platform One, a space station hanging above the dying Earth. And, to all the Doctor Who geeks out there, The First Doctor, Steven and Dodo have just arrived aboard the Ark, a story which the last survivors of Earth travelling to a new planet. Both The Ark and The End of the World take place at the same time! But there is treachery afoot. One of the guests plans on ruining the gathering by sabotaging the shields around the station as the Earth is destroyed. They intend to either create a hostage situation or kill everyone and claim compensation as the only survivor. There was a lot of marketing that went into this episode as it would be the first episode in the new series to feature plenty of colourful aliens. A lot of attention is paid to the aliens like The Face of Boe, The Moxx of Balhoon and the Tree People getting a lot of screen time. It was fine to give them that much screen time if any of them did anything. With the exception of Jabe, one of the tree people, none of them do much except stand around and get killed when the Earth explodes. The alien group were good, played slightly for children but this was contrasted by the grisly deaths of Jabe, the alien electrician Raffallo and the Steward. Considering it was aired in 2005, this episode now feels very much of it's time. It isn't going to be an episode that dates well thanks to music inserts from Britany Spear's Toxic and including an actress like Zoe Wanamaker. Both the actress and singer were popular then but almost unheard of now and bound to fade into obscurity as time progresses. But ultimately, this episode is another that is designed to settle us into this new world and the whole concept of the show. While Rose allowed us to see the world through Rose's eyes, this episode gives us an opportunity to see the world through the Doctor as we see how he operates. It was also a good idea to make this one the episode that explains why everyone speaks English. Thanks to the TARDIS translation system, a plot device to stop smart-arse critics from moaning. And the inclusion of the physic paper gets us past the Doctor having to explain who his is for the whole episode. We also learn that the Doctor is now alone in the universe, the Time Lords having been in a war. Little more information is given at this time which feels right as it should be told through multiple episodes. And we rightfully don't get any set pieces on Gallifrey to explain it. But, arguably the biggest thing to take away from this episode was how seriously the BBC was taking the show with its expensive looking visual effects. No longer do we have to see slightly dodgy looking effects. While it might date like other elements of this episode in the future, it should still look impressive. While this is another episode that is designed to settle us into the world of The Doctor, it does lack slightly in plot sticking to one of those murder mystery, Agatha Christie type plots than giving us anything really impressive. Like Rose, I don't think The End of the World will ever be considered something particularly special. I think it has to be treated for what it is, an episode that ensured our favourite show's survival.